Judge Randolph Isham Stow (1828-1878) was born in England on 17 December 1828, the eldest son of the Rev. T. Q. Stow . He came to Adelaide with his father in 1837, and was educated at home and by D. Wylie. M.A. He showed much ability as a boy and was articled to a firm of lawyers, Messrs Bartley and Bakewell. Shortly after the completion of his articles Stow became a junior partner, but about 1859 started for himself. Subsequently Messrs T. B. Bruce and F. Ayers became partners with him. 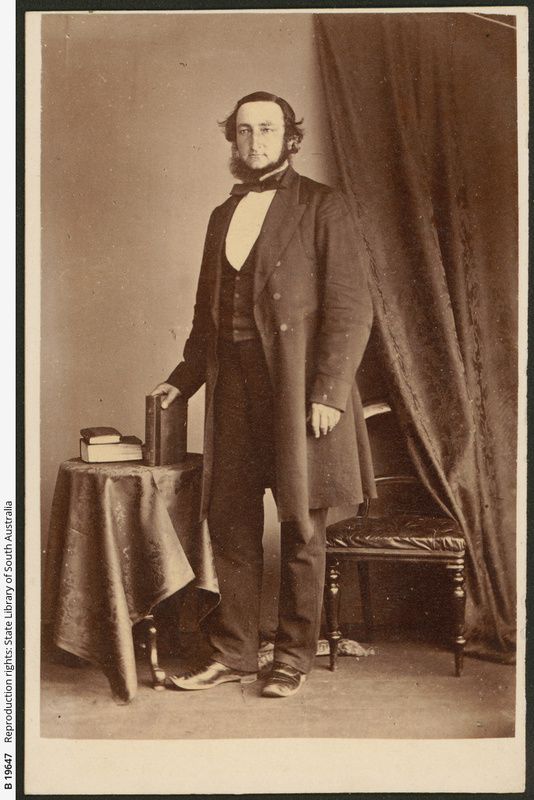 He entered the House of Assembly as member for West Torrens in 1861, and in October became Attorney-general in the G. M. Waterhouse ministry which held office until July 1863. He was Attorney-general again in the Ayers and Blyth ministries from July 1864 to March 1865 and then lost his seat. He became a Q.C. in 1865. He was elected to the House of Assembly for Light in 1870. By 1875 he was the unchallenged leader of the bar at Adelaide, and on 15 March 1875 was appointed Judge of the Supreme Court. His health had not been good and he died in his fiftieth year on 17 September 1878. He left a widow, four sons and two daughters. (from information supplied by a researcher).